The funeral of a former boxing champion who was killed after asking customers to stop smoking is taking place. 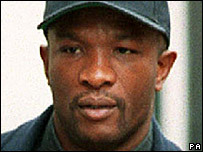 James Oyebola, 47, was shot dead in the Chateau 6 nightclub in Fulham Road, south-west London, on 23 July. He died in hospital four days later when his life support was turned off. Two men have been arrested and were released on police bail. The funeral service is happening at Our Lady of Grace and St Edward in High Road, Chiswick, west London. Police said the ex-boxer was shot after asking three men to stop smoking in a covered courtyard area at the back of the bar, on the Fulham Road. They believe three black suspects, aged between 19 and 25, ran from the club in separate directions. Mr Oyebola, who was born in Nigeria, won 18 of his 23 fights and was a bronze medallist at the 1986 Commonwealth Games in Edinburgh. He won the WBC international heavyweight title in 1993 and retired in 1996. Two men arrested in connection with the investigation are due to answer bail in September.